Rosie Cross has a very successful piano-teaching practice in Birmingham. 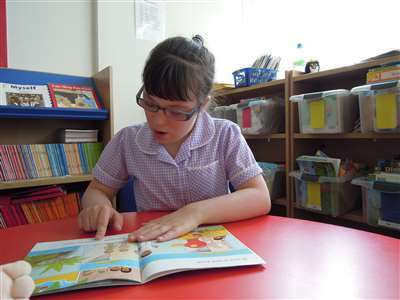 As well as teaching many able and high-achieving young people, for the past ten years she has been teaching pupils with Down syndrome and other learning disabilities. Five years ago she completed the Certificate of Teaching professional development course of the Associated Board of the Royal Schools of Music. This gave her scope to research methods of teaching music to people with learning disabilities. Rosie has now set up Melody, an organisation to promote music-making for people with learning disabilities and to help both teachers and parents. Over the past ten years I have heard many heart-breaking stories from parents wanting to give their children with Down syndrome the experience of learning a musical instrument, but unable to find a teacher willing to take them on. I believe very strongly that people with learning difficulties, however severe, have as much right to play a musical instrument as the rest of us. What is desperately needed is more teachers who are prepared to teach them, and who will persevere when progress seems elusive. When I agreed to teach Tom, my first pupil with Down syndrome, I had done nothing like this before. Tom and I have learned together - and his mother, Helena, has become a great friend and supporter. Tom has a very good aural memory and does not find it difficult to learn by rote. He doesn't read music, but enjoys having his music on the music rest, like his brothers and sister. The pictures on the page remind him which tune to play. At first Helena and I did try to teach Tom to read music, but I have found over the years that it is not necessary for him to read notation to be able to play the piano. We do a lot of creative improvisation together, and this is what he enjoys the most. Children with Down syndrome have a well-developed aural memory and a gift of mimicry. Pieces can be taught by rote - and may take a long time to achieve. I have looked at a vast array of books for the young beginner and can thoroughly recommend the books published by the American music publishers, Alfred. The books A to E for the very young beginner have unlimited material in the five-finger position and are based on tonic-dominant harmony. The presentation is for very young children, but this certainly doesn't bother Tom, who is working through book 4 at the age of 17. As with all young piano pupils, the first target is to learn how to use their fingers on the keys. This can take a long time for a child with Down syndrome. Starting on the two black notes, we do a lot of work with the index and middle fingers of each hand. This can then be extended to the fourth finger, using the three black notes. In between, we play a lot of games and do other musical activities. It's vital to encourage a lot of improvisation from the very beginning. Children with learning disabilities are often very good at illustrating pictures or stories on the keyboard. They don't get as worried as my other pupils about living up to what is expected of them and they are often delightfully uninhibited. So many music teachers have said to me: "I would love to teach pupils with learning disabilities, but I don't have the experience and I don't know where to start …" It was to start to show them that they did have the necessary skills and experience that Helena and I began to work on the idea of a Music Day that would bring together teachers, parents and young people with Down syndrome, to show teachers what can be achieved, and to talk about taking my ideas forward. Response to our plans for the event was overwhelming, and many more people wanted to attend than we could accommodate. The 130 people who came to the Music Day in Birmingham enjoyed a concert performed by people with Down syndrome and other disabilities, on piano, violin and other instruments - including bagpipes. Our guest speaker, Lucinda Mackworth-Young, discussed the psychology of the relationship between pupil and teacher and introduced some simple ideas for improvisation. One of the main messages to come from delegates at the Music Day was that there are a lot of teachers who would be prepared to teach people with learning disabilities - but they don't know how to go about it. Since then I have begun to set up a charitable organisation, Melody, to show teachers that they can do it, not through the traditional teaching methods, but with a lot of patience, perseverance and imagination. Another message, from parents, was that they also needed guidance in how to introduce their children with Down syndrome to simple music-making - and also that they wanted to be able to find qualified music teachers in their own area who would be willing to give lessons to their children. Melody aims to meet the needs of both teachers and parents, and through them to bring the joy of playing a musical instrument to people with Down syndrome and other learning disabilities. As well as organising events such as an annual Music Day, Melody is developing a website to promote instrumental teaching for people with learning disabilities. By joining Melody, teachers and parents will gain access to suggestions for effective teaching methods. We also hope to gather and share more ideas from other parents and teachers about what has worked for them. Teaching children with Down syndrome is a slow but rewarding pathway to tread. It is definitely not for the teacher who sees teaching mainly in terms of examination successes. Both teachers and parents must be prepared to accept that there will be failures, and there will be lessons when we seem to get nowhere. This is fine! We must learn to feel good about these sessions as well as the ones that have gone well. For teachers, actively involving parents - in both lessons and practice - is essential for success. Progress can be extremely slow. Ziekel, a young pupil with Down syndrome, came for lessons for a year and seemed to make only slow progress. Then he suddenly took off, and he now enjoys improvising and illustrating a story in music, using the whole keyboard. His father, Colin, tells a story - it may be one about Ziekel himself, or it may be based on a tune that he particularly enjoys - and Ziekel illustrates what is happening on the piano. With improvisation, I find that it's best to start with very simple ideas. I draw a happy smiling face and ask my pupil to illustrate it on the piano. Then I draw a sad face and ask him or her to do the same - to draw a picture of the face on the keyboard. Then you can ask the pupil to play one or the other and someone else - perhaps Mum or Dad - has to guess which one it is. How to measure success is a matter for discussion. The usual landmarks of achievement - passing exams, entering music festivals - do not apply. Tom comes from a family where the other children are progressing steadily up the Associated Board grades. What we have done in his case is to undertake two Associated Board Performance Assessments. We set our own agenda for these and keep a record of what he has played each time, so that progress and development can be traced. This means that Tom has his certificates to show, just like the others. In other families, it may be enough for children to perform to a sympathetic audience. As part of the first Melody Music Day last February, people with learning disabilities came to Birmingham from all over the country and took part in a concert that gave magnificent proof, if it were needed, that they can both take and give pleasure through playing a variety of instruments: piano, violin, trumpet, even the bagpipes! The benefits are not confined to the immense joy that comes from being able to play recognisable tunes and performing to an appreciative audience. When Tom first began to learn the piano, his mother noticed that he was suddenly able to handle a knife and fork properly for the first time. Better co-ordination, improved speech and communication and increased self-confidence and self-esteem have been noted by other parents. It is still early days, but membership of Melody is building fast. There are details of how to join on the website at www.melody.me.uk - or you can contact me for information (rosie@melody.me.uk). At this stage we need as much help as possible from people willing to pay the modest annual membership fee and give us their support. I am starting to give lecture demonstrations of what can be done, helped by some of my pupils with Down syndrome. I intend to spread the word that people with learning disabilities have the same right to play a musical instrument as anybody else, and that teachers already have all the skills needed to lead them into the wonderful world of music. All they need is a little help and guidance, which is what Melody can provide.